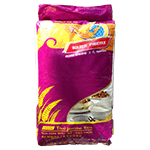 Golden Phoenix Thai Hom Mali Rice is a premium Thai Jasmine rice originating from Thailand that is popular with its distinct taste and natural fragrance. Slightly sticky when cooked, Thai Hom Mali tastes best steamed. Steaming will fluff up the rice while retaining the fullness of its natural fragrant flavour. Versatile and adaptable, this rice is widely used in a variety of recipes, from Western to Asian cuisine. Product of Thailand.